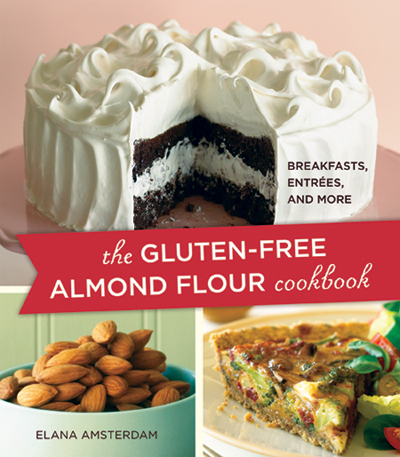 The Gluten-Free Almond Flour Cookbook by Elana Amsterdam is one of my favorite almond flour cookbooks. It is not actually an SCD cookbook, but most of the recipes are adaptable. Amsterdam’s sweetener of choice is agave nectar, which is not allowed on SCD. I just substitute honey, and have had good results so far. She also uses chocolate, so SCDers will have to skip those recipes (though I do use chocolate occasionally). Some of the recipes I have made are her biscuits and scones, cookies, fish sticks, and chicken tenders. I like that most of the recipes are fairly simple and use ingredients that are pretty easy to find. She does not use butter for cooking. She uses grapeseed oil instead. I sometimes use grapeseed oil, but sometimes I substitute butter in the same amount. For some things I actually think the butter works better because it is not as liquidy (unless you melt it). For cookies I like to use softened butter, because I think the texture is better. I like that most of the recipes are gluten-free adaptations of the basics. There’s pancakes, vanilla cupcakes, muffins, cookies, and many comforting main and side dishes. Even though this cookbook is not specifically for SCD I still recommend it (as long as you can stand looking at pictures of chocolate cake and chocolate chip scones). The recipes are good and easy to make.